The fifth mosaic was found in 2006 by INRAP specialists. 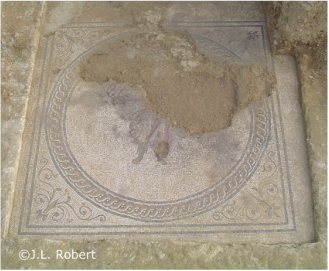 It is about 5 feet wide and was located in the residential section of the villa. 30 inches wide the border is composed of two white and two black lines. In the center a panel 5 feet across. In the corners, palms with petals. The center part shows a human figure, certainely a man. Only one arm and a leg are left. The man wears a red cape. His shoes are unusual laced up to his half calf. He looks like a hunter. His opened hand indicates a rapid movement. The density of the marble pieces is remarkable : 180 pieces per 10 squere centimeters.